ORICO Feature 3.5 inch HDD Enclosure achieved with unique Tool Free design,Plug and Play ,No Tools & Screws Needed when mount or un-mount Drive.Allow to get Multi Drives Accessed via your computer by take one Drive out and put another one in.Super - Speed USB3.0 offer Transfer Rates Up To 5Gbps , 10x Faster of USB2.0,Backward compatible with USB 2.0 and USB 1.1 device.Large-scale data processing and mass data storage,Supports 3.5 inch HDD SSD,Up to 4TB Hard driver (Max).At home or the office, ORICO 3588US3 can stream your movies, photos and music to PC and Mac computers. 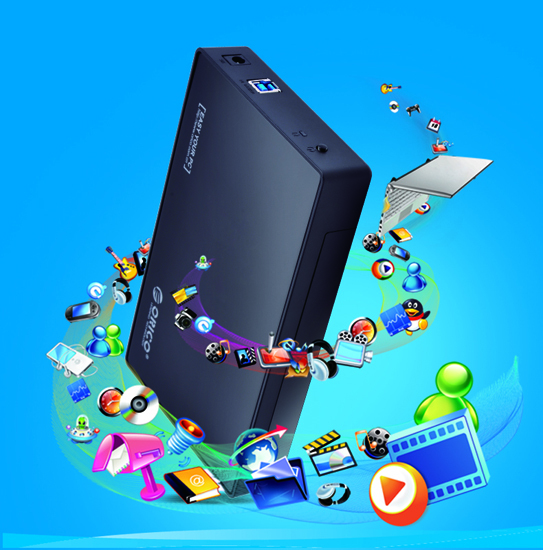 Now you can easily enjoy your media library , game consoles, Internet TVs and more. ORICO 3588US3 build-in Super Speed USB3.0 Controller with 2 Foot USB3.0 Cable offer an Easy and Reliable Connectivity up to 5Gbps,10x Faster of USB2.0 and Backward Compatible with USB2.0,USB1.1 & USB1.0.Plug and Play,All you need is put you Drive in and Attach it to your Computer,No Reboot and Additional Driver is needed.It is a Super Compact and Slim Enclosure for Carrying & Travelling.Allow to take Valuable Files With you anywhere you are.If you are looking for something to get your Internal Drive External,It will be the Key Solution.